. When he was 5 years old Peter moved from Ebenezer to St. Kitts where his father had built their new home [It is still standing, though now unoccupied]. Peter attended the Lutheran Day School at St. Kitts under teachers Rechner and Klar and was confirmed 14.3.1880 in the church at Stockwell by Pastor Maschmedt. ConfirmationText John 21 verse 7. “Came to Appila March 17th 1880”. Possibly his older brothers John and Andrew were already living there. 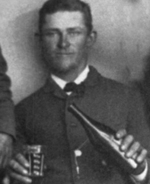 Ernst had married in 1878 and he lived in the Barossa Valley. Section 99 – Booleroo – in 1877, and Section 209 Wirrabara from Menz on 3.11.1879 (cf. Wirrabara Book) and sections 110 and 131 – Appila on 17.6.1880. Peter was a qualified blacksmith or wheelwright, but I do not know where he served his apprenticeship and learnt his trade. He was about 14 or 15 years old when he moved north. It was most likely he learnt his trade at Caltowie with the blacksmith Steicke, but it could have been at Wirrabara with Wiley. His son Edgar said his father often spoke about the blacksmith at Caltowie. Peter met Caroline when she went to Appila to work for her sister, who had married a Jaeschke. Her family lived in the Adelaide Hills at Western Flat, between Mt Barker and Echunga, nearer the Echunga end. […from Reg Butler. Local historian]. Caroline was the third of six children born to Johann Friedrich Wilhelm Wandke (born 30.1.1834 at Leitersdorf, Germany. Died 8th May 1902) and his wife, Maria Elisabeth Wandke nee Kaläue (born 13.3.1834 at Leutnitz, Germany. Died 18.1.1909). Caroline Welhalmine Wandke was born 9.2.1867 at Lobethal in South Australia and baptized there by Pastor Krause 24.2.1867, and was confirmed 30.11.1879 by Pastor J.M.R. Ey. Text Romans 3.28. She worked in Balfours cake shop in Rundle Street in Adelaide before she married. “She learnt to make the good pastry. She was a great cook and her 2 daughters are too” – Ed Zwar. Caroline became known as “Minna”. Minna signed her name clearly as “Caroline Welhalmine Wandke” so I have used this spelling. Sometimes her name has been given in different spellings. 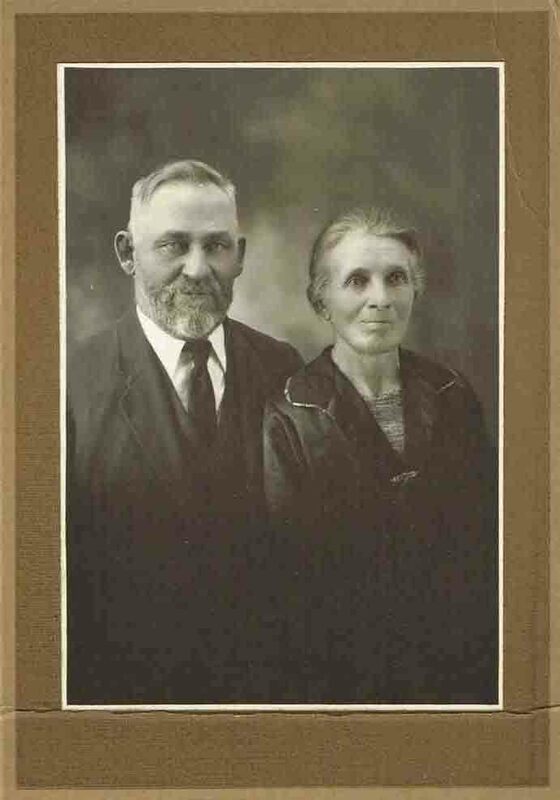 Minna and Peter were married at Hahndorf in the Adelaide Hills on 9th February 1894 (her birthday) when they were both 27 years old. Pastor Strempel married them. , C. Wandke, farmer, living near Mt. Barker, Pauline Boerke (Hahndorf). Kevin Peter Zwar, a grandson, now wears Peter’s wedding ring. His parents Peter Zwar Snr and Magdalena lived in the same house for a time after 1905. I understand that Peter had built it years earlier. It had a thatched / straw roof. Agnes was born in this house. “Mum said I cried all the way to the church [for my baptism] and home again, and then I slept when I was put in the crib.” … Agnes. They would have moved there in 1899. It seems Peter leased it for five years from Kentish, took out another lease for five years, and then he bought it. We don’t have written records of the first lease. Two copies of the full lease still exist, stating that Peter leased section 364 of Caltowie from Charles Kentish of Clarence Park (Adelaide) containing 569 acres on 1 March 1904 with the option to buy. ( £200 deposit 3 pounds per acre) plus £1507 balance, plus extra for the blacksmith’s shop and 400 posts. It is most likely that Peter had already leased the property for five years. The farm was on the edge of the Caltowie Shire, but the postal address was always Laura, where they did their weekly shopping. On 10th November 1908 Peter Traugott Zwar bought a three cornered paddock of 104 acres from Henry Hannett. It was sold to Edgar Heinrich Zwar on 5th June 1930 – a few months before his marriage, and to Glenn Zwar in 1975. On 14th September 1908 the land was transferred from Charles Kentish to Peter Zwar. When they moved to the farm they lived in the second house. It had two main rooms with a verandah. They built on two more rooms on the western end and on the eastern side a long room that ran right along the verandah as a lean-to for the kitchen. The cellar was there, but just covered with dirt (ie. nothing built over it.). They extended the cellar and a builder named Maywald made it deeper and built a small storage room over the top. The original house – or old hut – is where the working man now lived. It was a 2 roomed house. Peter built an extra room on the western end for the boys to sleep in. On the northern side Peter built on a buggy shed, and a blacksmith shop next to it. Just before Edgar married in 1930 the builder Shepherd, from Laura, renovated the main house and put a new gable roof on it and plastered the outer walls. When Minna needed help one of the Altmann girls (her nieces) would come, either Tillie or Lydia. The children remembered their home near Wirrabara had a baking oven, but not not this one. Peter used to do a lot of blacksmith work when he lived on the farm. He was the blacksmith of the district, and a wheelwright. In the 1914 drought Edgar can remember 20 strippers standing in a line at the blacksmith shop mainly to fix up their wheels. Sometimes his daughters had to pump the bellows. The children were fascinated to watch Peter weld iron together. The girls had to work on the farm at harvest time too. “We worked stooking hay, loading it, and carting the wheat.” .. Agnes and Mary. “Father sent me to help the neighbour too because he was loading on his own!” …Mary. Albert Nayda (from Appila) worked for Peter for years as the farmhand until the children grew up. He loved to play cards. He lived in the ‘hut’ – the original house on the place- next to the blacksmith shop. The annual church picnic was their big social day! In the early days it was held by the Pine Creek, down from the Church and near the crossing. Later it was held at Becker’s scrub in the nearby hills. Peter share-farmed land for Davidson (1914), who was a bachelor. Then he share-farmed land for Kargers, and then for Westons. He also share-farmed for Traugott Pech for some years. The land hadn’t been worked and the first year they got 8 – 10 bags an acre. Peter was the first person in the district to buy an eight foot Sun header. He bought for £220. Peter worked the Wirrabara land too. Alf and Ed would walk a plough and horses to Wirrabara and stay there for a week or so. Alf had a five furrow plough and seven or eight horses, and Ed a three furrow plough and five or six horses. The horses would get footsore from the stony ground. They had several good crops there as it was virgin soil and had a higher rainfall than Laura/Caltowie. 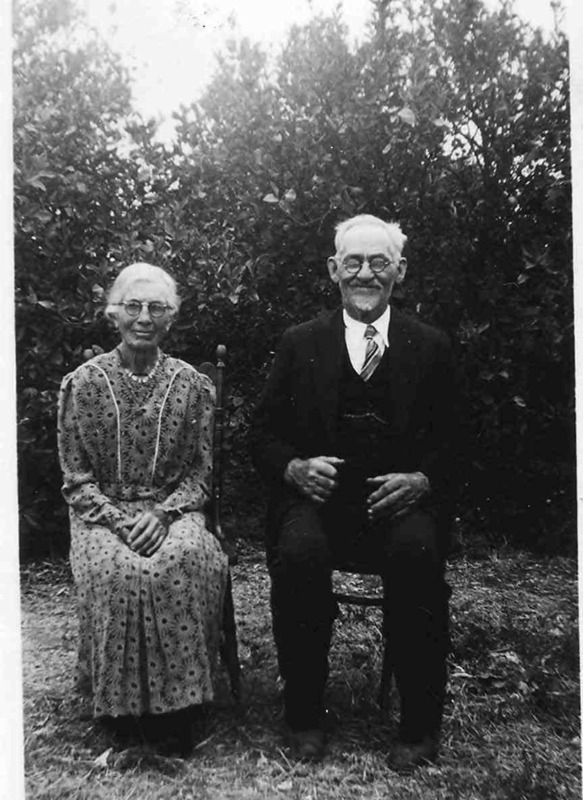 Peter was the Yardmaster (Property Supervisor) at the Pine Creek Lutheran Church for 25 years, from 1909 until 1942. Quiet and reserved by nature, he was happiest when he was using his skilful hands to repair a piece of equipment for the Church or for his neighbours. Minna did the shopping on Fridays in Laura. She took the buggy in to town. She took in butter and eggs to sell. She potted a lot of butter for the baker. She was a good cook and entered produce in the Laura show. Bread, butter, cake, poultry. FATAL ACCIDENT — On Sunday last a sad accident occurred at the residence of Mr P. T. Zwar, Caltowie extension. Mr Zwar had occasion to leave home for the purpose of getting assistance in the household duties during his wife’s illness, and left his mother in charge of the patient. Shortly after two of his children – one a boy of about five years of age and the other a girl about three years were playing in a shed near the house where 83 bags of manure were stacked. They made a hole in one of the lower bags, causing the manure to run out, and those on top fell over, killing the little boy – Hermann Wilhelm. The other child had its head underneath a bag, but was unhurt. Much sympathy is felt for the bereaved parents. They went to the Pine Creek school weekdays, and to church on Sundays by horse and cart via Almond Tree corner. On the way to school they picked up Lange’s and Wurst’s and there were about 6 or 7 children on the cart. It was a solid cart. The children went to the Pine Creek Lutheran School until the first World War. When the government closed the Lutheran schools the Zwar children went to the Stone Hut Public School. Marie went to Stone Hut for the last few months of her schooling. Edgar went to Stone Hut school for 9 months for the last of his schooling. Smith was the teacher. Peter and Minna always spoke German at home. The children did not learn to speak English until they went to the Stone Hut school during the first World War. All the children stayed home after their schooling finished. The Silver Wedding of Peter and Minna was celebrated on the farm in 1919. A photo shows the numerous relatives and friends posing outside the house. The silver wedding dinner was held in the barn that had been built just in time to host the celebrations. cf. photo’s of the celebrations/cake. 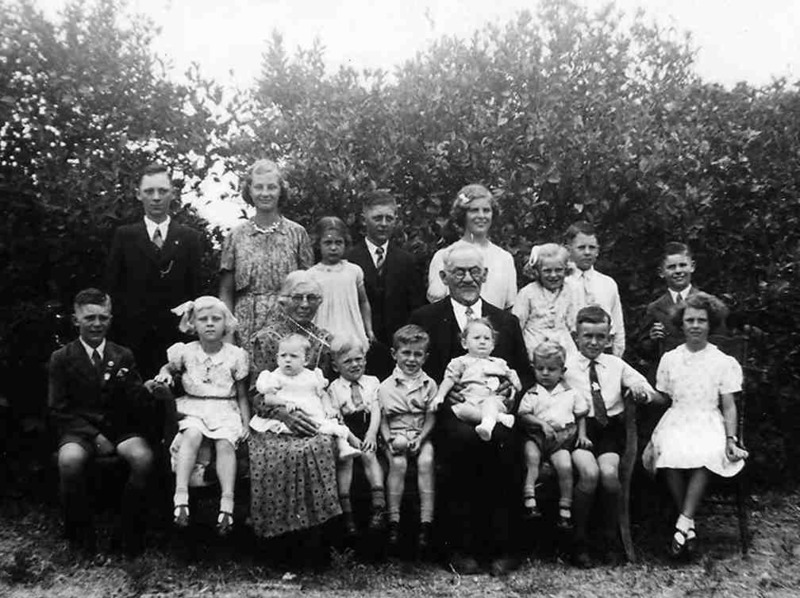 Of Minna and Peter’s children, Alf was the first married (1924). In 1925 Agnes married and Marie in 1927. Edgar lived at home with his parents for a while and then he batched for some weeks after his parents moved to the Laura blocks on 14th August in 1930. Edgar married in October 1930. Retirement in LauraPeter and Minna lived on the Laura blocks for the rest of their lives. Minna owned the land. They originally bought it from Hill with money she inherited from her parents. Different people had rented it for years. Her brother Fred Wandke (married Altmann) lived there for a time. She had 3 or 4 cows for a time. When he retired to the Laura blocks Peter did odd jobs for people. He had his blacksmith there. Peter went to a lot of clearing sales and bought scrap metal to mend other people’s broken down machinery. They also grew a lot of vegetables in the first years and lots of citrus fruit trees. There was a huge mulberry tree near the kitchen. Daughter Marie and FamilyOn the Laura blocks where Peter and Minna retired their daughter Maria lived several hundred metres nearby and helped them a lot. Marie and Herb Schultz had even lived with her parents for a while until they bought their own house close by. “I lived with Grandfather Zwar for a while, and helped to cook for him. The neighbour, Mick Coles grew vegetables for sale around Laura, and Grandfather would help to wash the carrots. Grandfather made a shower out of a kerosene tin, by drilling holes in the bottom. He then poured a bucket of water into it for a quick shower. “We loved our Grandfather and sometimes stood in awe of him. He always needed to be early when he went to church, so while we lived with him, and so that we got the message, he would sit in the car, at least 15 minutes before departure time, wearing his dust coat, and wait for us. That made us hurry along. Welhalmina died 2nd May 1943, aged 76 years. “Mother grew weak and died. The doctors (two, one from Jamestown) said she had a lump in her right side – near the appendix – it had been an injury, healed, and later may have become cancerous – a growth.” (Her daughters). Caroline Wilhelmine, beloved wife of P.
Agnes, Alf., Marie, and Edgar, aged 76. The Late Mrs. P. T. Zwar. “The death occurred on Sunday, May 2, 1943, of Mrs Caroline Wilhelmine Zwar, at her residence, Laura Blocks at the age of 76 years. She was a daughter of the late Mr. and Mrs Wandke. The deceased was born at Tweedsvale on February 9, 1867, after spending most of her youth in the Mt. Barker district she came to stay with her sister, Mrs. E. Jaeschke in the Appila district. On February 9, 1994, she was married at Hahndorf to Peter Traugott Zwar; after their marriage they resided at Wirrabara for five years, then purchased a farming property in the Hundred of Caltowie, where they were engaged in farming pursuits for 30 years. In 1930 they came to retire on the Laura Blocks. She was a member and an ardent worker of the Lutheran Church all her life, and was a good faithful wife and a loving mother. Her quiet and friendly nature won for her a large circle of friends. She is survived by her husband, two sons, Messrs. Alfred (Wirrabara) Edgar (Hundred of Caltowie) and two daughters, Mesdames F. E. Borgas (Wirrabara) and Herb. Schultz (Laura); two sisters, Mesdames E Jaeschke (Waikerie) and G. Klemm. (Narromine, N.S.W.). “For the rest of grandfather’s life we helped to look after him. We took Grandfather to the Pine Creek Lutheran Church every Sunday. He always wore his dust coat to Church to keep his suit free of dust from the dirt roads. Mum cooked him a nice hot meal every day. Us kids would take it in turns to carry his meal across the small paddock. Once or twice it was dropped on the way, however we hoped he never noticed!!! “Not only did we cross the paddocks with his lunch, but also with our broken toys. Being a blacksmith, he was able to mend out toys and bikes in a way that they never broke again. No matter how big or small, he would try to fix it. We sometimes watched him at work on his forge and anvil as he shaped a spare part. Maurice learned skills from him which were valuable to him on his farm later in life. From toys and bikes to pitch fork handles grandfather could fix it. We treasured him for all that. Grandfather made many toys for his grandchildren, such as 3 wheeler bikes and 4 wheel wagons. Often the wagon wheels were made from shoe polish tins. Then Kenneth would put Gladys in the wagon and pull her round the house yard, often on a slight slope. Grandfather enjoyed watching the grandchildren play. Peter’s other children helped to look after Peter too in various ways but it was not as convenient as they did not live close by. His neighbours would take Peter to the Pine Creek Lutheran Church on Sundays when he would meet with his friends and some of his own family. Peter died on 23rd March 1955, aged 87 years. “The night your grandfather Zwar died, Uncle Alf, Herb and Ed were at the bedside at his home reading Scripture texts, especially the hymns on the second article of the creed, including “Jesus Thy Blood and Righteousness” (in German)… About an hour or two before he died, suddenly his face lit up, and he called out “Das Licht, das Licht” [the light, the light] as if he could see a bright light we could not see. He was quite excited and we couldn’t see anything!” … Ed & Rita Zwar to Kevin Zwar.